Originally published in the Official Alumni Publication of the Ostrow School of Dentistry of USC, TroDent, Summer 2012 edition. State budget deficits brought tuition hikes to many public colleges and universities across California, but none of those hikes looked quite like this. As part of his new scholarship program, Ostrow alumnus David Eggleston DDS ’70, Pros ’72, took 36 dental students (plus four guest hikers) for a competitive hike up Black Star Canyon in Orange County. Each of the dental students was guaranteed a $200 scholarship at the trailhead but could earn more if they finished the hike ahead of Eggleston. An avid hiker, Eggleston said his best time is 1 hour and 49 minutes. In all, 12 students beat Eggleston to the top of the 7.6-mile winding path (with four miles of switchbacks). Twelve of them walked away with $500 scholarships. The first two to reach the summit received $1,000. 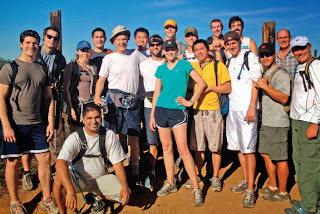 In contrast to the race uphill, the leisurely hike downslope afforded the students lots of time for camaraderie. The hikers represented each of the four DDS classes—including ASPID—plus dental hygiene, Eggleston said. First-year students commented how great it was to spend time with fourth-year students in such a relaxed atmosphere. Waiting at the end of the hike with food and beverages were Eggleston’s wife, Laraine; his dental office staff; and his friend, Dr. Michael Gahagan. The next event is scheduled for October 2012. Eggleston said he plans to expand the program into two separate competitions. Like last fall, there will be a hiking group competing against Eggleston to the top. He’ll add a second competition where joggers or runners will have to reach the top within a set time of a little more than an hour. All of the arrangements will be coordinated by Vo.